Mobilink jazz is highly well-organized telecommunication of Pakistan that is serving telecom service throughout in country from last many years. It provides phenomenal packages and features for its valued subscribers of Pakistan and it gives packages with affordable rates for customers and users of this network easily attract to activate multiple offers of this network. It also gives reliable value added service for customers and now it has launched a facility to get or borrow Mobilink Jazz loan for its subscribers. Subscribers get loan of RS 15 for using as an advance balance. The procedure to take loan is simple just need to dial 123 and press 5 and then press 1 to avail this facility. Users can also receive advance balance by dialing *112#. The charges of this service are RS 2.99 inclusive. Consumers can only get this loan when it has below of RS 5.00 balance into his/her accounts. Telenor is emerging telecommunication company of Pakistan and it provides exceptional packages for calling, texting and internet facility for its subscribers. It provides reliable features with cheap charges and it has countless subscribers from all over in Country. It also gives multiple quality facilities of its customers and finally it has launched Telenor loan facility for consumers. The complete details loan of offer is mentioned as below. Consumers can get loan of RS 10 by dialing *0# and press call button. This service is available all the Djuice and Talkshawk subscribers of this network. The service fees are RS 2 plus tax and it will be deducted from next balance re-charging. Consumers can get this loan when below RS 5 in his/her account. Ufone is most reliable network company of Pakistan and there are countless cellular operators who rely to use telecommunication service of this network. It is highly popular network of Pakistan and cellular operators use this network service to avail multiple telecommunication facility. It gives astonishing incentives and rates of various packages and deals. It also provides reliable 3G internet technology of its valued consumers. 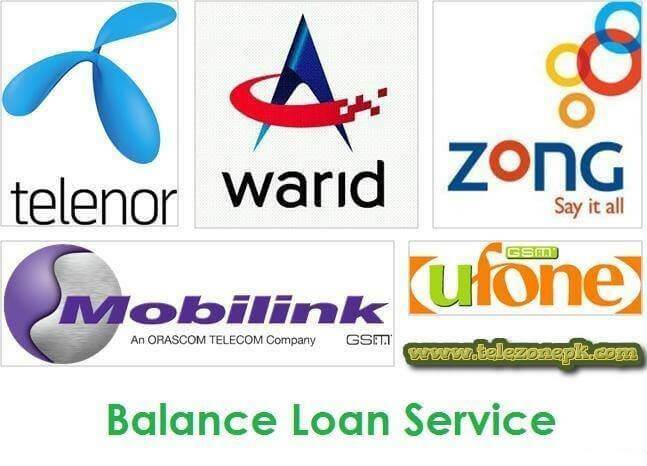 It serves a reliable Ufone loan feature for subscribers and users can get loan on emergency time. It provides two time facilities to receive Ufone loan. Customers can get loan first time by dialing *456# and press call button. Customers can get second time loan by dialing *456# and press call button. Subscribers can receive RS 15 balance loan on single time. The charges and taxes to receive loan are RS 1.79 for taking one time balance. The second time loan receiving are same RS 1.79. Zong is the latest telecommunication network of Pakistan but now it is most popular network service. It provides smart incentives packages for its valued consumers and this is the main reason mostly consumers want to avail multiple offers of this network to use on daily routine. The charges of features are extremely low and users can easily afford multiple Zong packages to use. It also gives Zong loan service for its consumers and customers easily borrow loan at anytime with correctly. This telecommunication is providing this service with the name of “Zong Rescue”. Subscribers can receive RS 50 balance by using this facility. Customers can easily get the loan through SMS just need to write text “Rescue” and send into 911. Warid is highly reputed telecommunication service of Pakistan. It provides a quality postpaid and prepaid service of its valued consumers. The packages and offers are extremely good and mostly cellular operators want to use multiple quality features of Warid. This is first telecommunication of Pakistan that is serving 4G LTE service for its valued customers. It provides multiple customers care facility of its users and it has launched Warid loan facility for its customers. The details of Warid loan procedure are given as below. Subscribers easily get Warid advance balance through SMS service just need to write message “AB” and send into 7676. The service charges are RS 2 plus tax. This facility is available only for prepaid subscribers of this network. This facility is eligible only those customers who are connected with this telecommunication from last four months. Click here to get Help-Line numbers of Warid, Zong, Ufone, Mobilink and Telenor. You may also like details of Mobilink call history service.